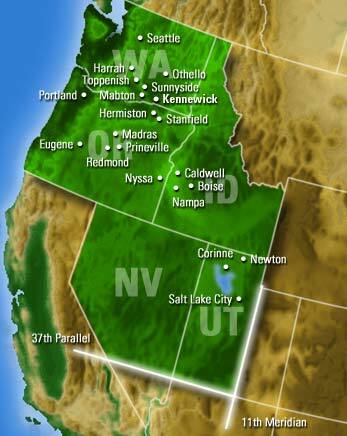 The Northwestern United States (The Far West) is the premier spearmint producing area in the world. The states of Washington, Idaho and Oregon accounted for 83% of U.S. spearmint oil production in 2001 and in excess of 50% of the total world spearmint oil production. The world production of spearmint oil is somewhat unclear at this time because of the unavailability of accurate production figures in countries such as China and India. Of the 1,711,000 lbs. of spearmint oil produced in this area in 2001, 1,484,000 lbs. (86.7%) was produced in Washington, 95,000 lbs. (5.5%) was produced in Idaho and 132,000 lbs. (7.7%) was produced in Oregon, Nevada and Utah. The Far West, without question, also produces the highest quality of spearmint oils in the world. b. District 2. The State of Idaho and that portion of the States of Nevada and Utah included in the production area. The unique soil characteristics of the Far West spearmint oil region combined with hot summer days and cool night results in the production of the finest quality spearmint oils in the world. The U.S. mint industry, under the Mint Industry Research Council, continues to lead the world in research of mint oil production and composition. It is our commitment to continue to produce the world’s very best mint oils. The Far West is a leader in the United States mint industry, which is the world’s most dependable supply of mint oils. The major production areas enjoy moderate seasons and minimal weather related production problems. Under the Far West Spearmint Oil Marketing Order, growers continue to produce and hold ample quantities of spearmint oil in reserve to cover any unexpected production shortages. Technological advances have resulted in yields of 150 lbs. or more per acre, making us the most prolific producer in the world and assuring you that there will always be oil available. Since 1980, the Far West Spearmint Oil Administrative Committee has sought to bring stability to prices of Far West Spearmint Oils. We continue to seek stability, but are intent on being competitive in world markets at the same time. The Committee has adopted a policy of making ample oil available to the market. In conjunction with state of the art technology and superb growing conditions, the Far West grower is competitive with comparable mint oils from anywhere in the world.